A year ago, we reported on Behringer's plans to create Eurorack hardware and the plans for 13 modules that arrived shortly after. In January, that forthcoming line-up was boosted to 40 modules. 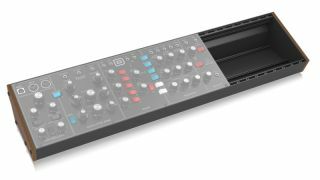 Now Behringer has announced the first member of its Eurorack line-up, and is leading with its logical hand, previewing the Eurorack 104 skiff case, which is expected to be available at the end of May. The case will presumably be able to house all of Behringer's future Eurorack modules, as well as other 3U-sized modules from other manufacturers. But the potential biggest draw is the price, with the Eurorack 104 being available for €75 (£65). Given Behringer's track record in announcing products and building hype, it's quite possible that more modules will be announced before the May release of the skiff case. If the idea of a 'starter bundle' of Behringer Eurorack gear seems like a logical strategy for sales, you might expect oscillator, filter, envelope and mixer modules to be announced soon. We'll keep you informed. Find out more at the Behringer website.